Why do humans, uniquely among animals, cooperate in large numbers to advance projects for the common good? Contrary to the conventional wisdom in biology and economics, this generous and civic-minded behavior is widespread and cannot be explained simply by far-sighted self-interest or a desire to help close genealogical kin. In A Cooperative Species, Samuel Bowles and Herbert Gintis–pioneers in the new experimental and evolutionary science of human behavior–show that the central issue is not why selfish people act generously, but instead how genetic and cultural evolution has produced a species in which substantial numbers make sacrifices to uphold ethical norms and to help even total strangers. The authors describe how, for thousands of generations, cooperation with fellow group members has been essential to survival. Groups that created institutions to protect the civic-minded from exploitation by the selfish flourished and prevailed in conflicts with less cooperative groups. Key to this process was the evolution of social emotions such as shame and guilt, and our capacity to internalize social norms so that acting ethically became a personal goal rather than simply a prudent way to avoid punishment. 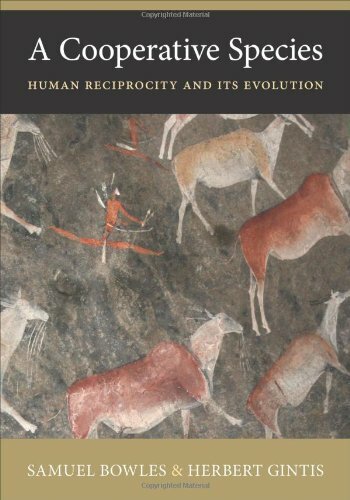 Using experimental, archaeological, genetic, and ethnographic data to calibrate models of the coevolution of genes and culture as well as prehistoric warfare and other forms of group competition, A Cooperative Species provides a compelling and novel account of how humans came to be moral and cooperative. Samuel Bowles heads the Behavioral Sciences Program at the Santa Fe Institute and teaches economics at the University of Siena. Herbert Gintis holds faculty positions at the Santa Fe Institute, Central European University, and the University of Siena. The authors’ recent research has appeared in Science, Nature, American Economic Review, Journal of Theoretical Biology, Behavioral and Brain Sciences, and Current Anthropology.